Measures 16" in length and is available in three other colors, including red, black, and green. With different colored handles, you can easily designate a particular color for specific use in the kitchen to help reduce cross-contamination. A scalloped end design aids in picking up just about any type of food. The 16" Stainless Steel Yellow Scalloped Coated Handle Tong are sturdy and versatile. They are easy to close and they close evenly. The coated handle prevents burns on your hands. It holds up great in high heat. Used the 16"' Stainless Steel Yellow Scalloped Coated Handle Tong to pick up a wheat oat bun. The yellow just pops when you are using the tongs. It just makes serving the buns so much more festive. 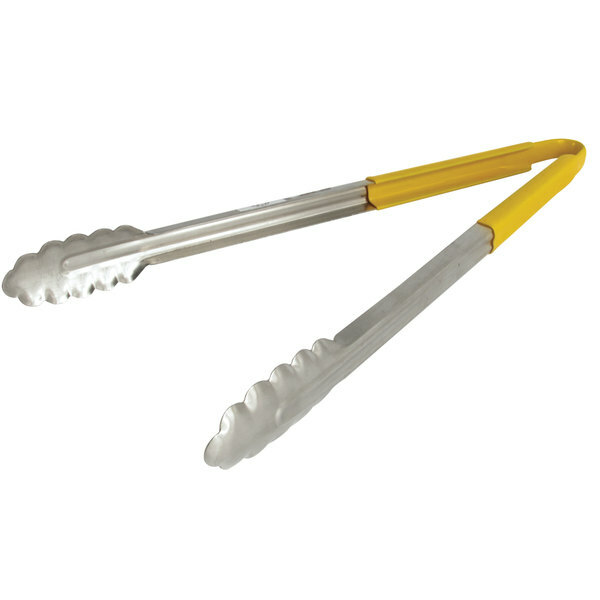 These 16 inch yellow tongs are used for poultry products, and have disappointed us so far. The rubber peels away from the handles, allowing stuff to get between the handle and the metal, and the tongs feel cheap overall. Love these tongs! They are so great for everything. We love the color coded system and this makes it so much easier for employees to know what something is used for! a great tong can be hard to find. but with this color tong no more broken springs. great product and super price we love it and will buy the whole line.